As a vacation, though, it was wildly successful. There were some things on the West Coast that I had wanted to see, and I got to see them. I saw The Winchester Mystery House. I saw The Esalen Institute. I saw The Madonna Inn. 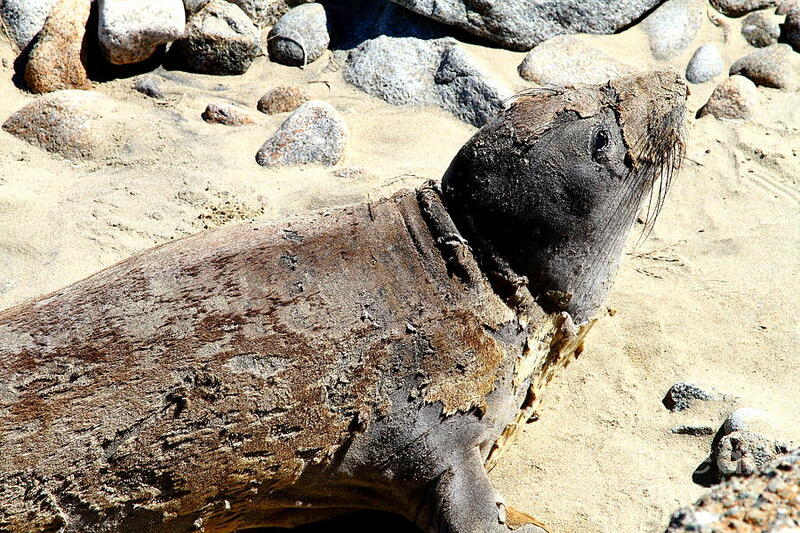 I saw molting seals. I saw The Watts Towers. I saw The Museum of Jurassic Technology. And, best of all, I finally got a chance to see and use Deaver’s Great Chain of Being. My rental car is blue. When my phone is not plugged into a power supply, like the one on the car’s dash, it dies immediately. It is my only map. I head east on the 46 to Paso Robles when my phone tells me to do so. I have only heard about Deaver’s Great Chain of Being. This will be my first time seeing it or using it. My phone directs me through Paso Robles to the eastern edge of town, to a small cottage home with a wooden sign that says, DEAVER’S GREAT CHAIN OF BEING ALL WELCOME. I park on the street. I pull my phone from the power cord to take a picture of the cottage and the sign, but it—as I expect—dies immediately. Angela Deaver was an African American woman born in southern California during the Great Depression. Her family’s pastor taught her to read. She loved reading more than anything. She went to an accounting vocational school and in the late 1940s, was hired by International Business Machines (IBM). She was good at her job. As IBM innovated computer technology through the 1950s—we went from vacuum tubes to transistors in seven years—Deaver followed it all very closely. She befriended and picked the brains of engineers. She borrowed books. She became interested in not just how to use the machines she worked with, but how the machines she used were built. How they were “taught” to do what they did. How people “spoke” to them and trained them. After it was introduced in 1957, Angela Deaver taught herself FORTRAN. (It is believed that the only female member of the FORTRAN development team, Lois Haibt, helped her.) It was the first programming language in which she became proficient. It was not the last. I’ll sum this up quickly: the Platonic or Neoplatonic concept of the Great Chain of Being says that there is a hierarchy to all things, that God set the hierarchy and sits at the top, and down from him one finds the angels, the objects in the heavens, the nobles, the peasants, the animals, the valuable stones, and the finally the valueless stones. It is a concept that we still sort of follow—that living and non-living things exist in a hierarchy of value. It has informed the way we see the world for a long, long time. Asked to provide her religion on a loan application in the 1960s—can you believe, by the way, that such a thing used to be allowed?—Deaver answered, “Platonist.” And she was. In addition to her books on math and computers, Deaver started reading the classics of philosophy, and quit at Aristotle. She loved Plato and the cave and the Socratic method and the hemlock. And she loved the hierarchy. But like all reading and thinking individuals, she had her own interpretations of what she read, and adapted the work to her individual time, place, and experiences. Angela Deaver left IBM in the mid-1970s. She was a saver, and had saved enough money to live comfortably without employment for a time. She moved from San Jose to Los Angeles, California with a small suitcase, a copy of The Complete Works of Plato, and an IBM 5100 portable computer. Before she even found a place to live in Los Angeles, she made her way to the Crofton Building—LA’s famous Sunshine Skyrise—and rented an office. On the door, she hung a sign that said, ANGELA DEAVER, TECHNOPLATONIC CONSULTATION. For the next decade, she sat in that office. If she consulted with anyone, she kept no records. How she would’ve consulted people who came to her with problems, no one knows. Where she lived in LA, no one is sure. People in other offices in her building saw her arrive in the morning and leave in the evening, and they heard her typing. Whenever a new personal computer appeared on the market, she bought it. If she liked it, she kept it. If she didn’t, she gave it to someone. One incident her neighbors remember vividly: On January 27, 1984, she arrived to work with a new Macintosh computer. The rest of the day, aggressive, profane language issued from behind her office door. The next morning, they saw the computer in pieces in the hallway. Mila stayed in LA for the next two decades, doing her best to introduce people to Deaver’s work in that same little office. Then in 2005, she moved herself and it to Paso Robles. Rent issues. I am escorted into a small room in the cottage home in Paso Robles. There is an old personal computer there. I am told to sit at it, type RUN, press ENTER, and follow its instructions. Ms. Deaver’s thoughts are collected in a pamphlet. You can buy one at the cottage house. I am asked for my name. I provide it. I am asked for my date of birth. I provide it. I am asked for the contents of my last meal. I provide it. I am asked if I am a smoker. I say NO. I am asked if I have ever been a smoker. I say YES. For the next hour, I am asked questions, and I answer each one honestly. I figure, I am interacting with a computer. Why not just be honest. No one’s watching. The questions quite comprehensively walk me through my life—my youth, my work experience, my sexual history, my drug and alcohol use and abuse. It finds out about my regrets. (So many regrets.) It finds out what I am proud of. (So very little.) I tell it quite a bit. Deaver believed that one of the consequences of computer technology—and computer storage of information—was that it would one day lead to our digital immortality. That we would one day be able to download our consciousness, and that the downloaded file would exist forever, RUN forever, interact with other files forever. We would live forever. Further, the downloading would lead to faster and better thinking, faster and more incredible scientific advances, faster and faster everything. Soon after conquering death, we would conquer time. And once we had conquered time, the reclamation project would begin. All those who had died would be available for immortality. The digital humans who had conquered death and time could go back into the past, the project moving from the most recent lost generation to the next and the next, and download everyone at the moment they died. But whom would they save and whom would they leave to the void? Deaver believed that the Great Chain of Being would provide the answer. That a hierarchy based on the goodness and rightness of one’s life would be created. That each of us would be tested at the moment of our death. That the life flashing before one’s eyes moment was that test taking place. And a decision would be made. Eternal life. Eternal void. Deaver’s Great Chain of Being—her software—was, she believed, an accurate self-test to assist us in our quest for eternal life. We could take her test and determine if we had been and were currently living as best we could. We could make adjustments based on our results. We could take the test again whenever we wanted. Thing is, she never laid out the parameters of a good life. She only wrote a program that told us if we were within them or outside them. We have to figure out the rest. The top of the Great Chain of Being is God. Below God are the angels, the spirits. The first generation of downloaded would be those spirits. We could aspire to, link by link, climb to their level. If we could figure out how. I have my score. I leave the room where I have taken my test. I am shown a chart. “Your number is on here,” says the girl who escorted me to the room and then from the room. She’s young and has a pierced eyebrow. I wonder if she’s a believer in all this or if she just works here for the summers. If she’s from town, maybe. If she’d like to go out for a drink after. If she has a place nearby. Then I remember I don’t drink anymore. Then I remember I’m in a committed, long-term relationship. And I’m too old for her. And I’m out of shape. I try to remove her entirely from my brain. Not a chance. Try harder.